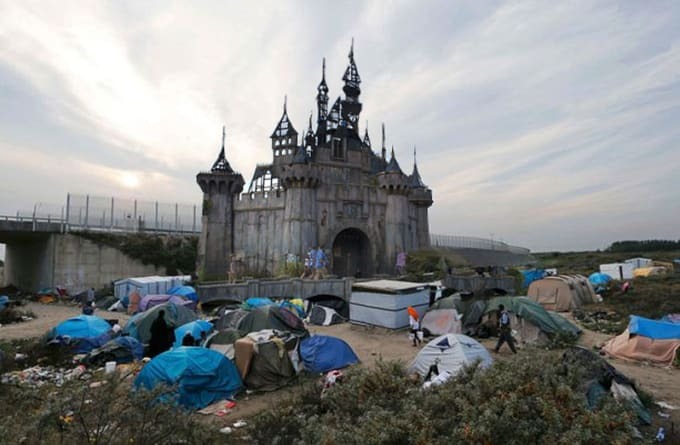 Back in August, Banksy announced plans to open his elaborate dystopian take on Disneyland, "Dismaland." After a highly successful 5-week run, the park&apos;s website revealed last night that it has officially closed its doors to be dismantled and moved to Calais, France. But, it won&apos;t be open to the public. Calais is home to almost 5,000 Syrian, Libyan and Eritrean refugees who will soon be able to seek shelter in the festivals&apos; building materials. Shortly after the elaborate bemusement park opened its doors in the UK resort town of Weston-super-Mare, over six million hopeful attendees crashed the site wanting to get a ticket. While it was open the exhibit attracted over 4,000 people a day, reports The Guardian. The disassembly is expected to take three weeks.